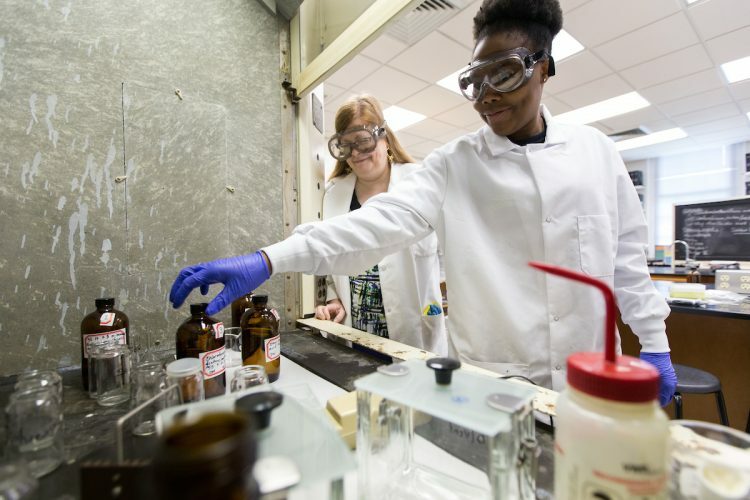 Drucilla Williams ’18 can’t help herself from thinking about the chemistry behind everyday items and activities. This summer, she’s putting that curiosity to the test. 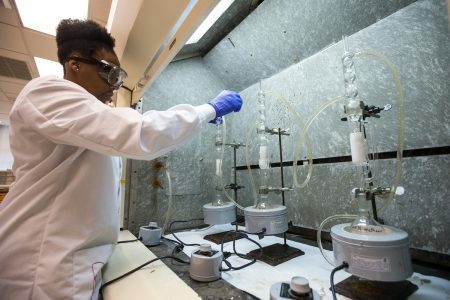 The chemistry major from Jamaica is examining something that directly affects everyone’s daily routine—their hair. Williams is partnering with chemistry professor Ann Fabirkiewicz for the Summer Research project, “Lipid Fingerprinting for Hair Analysis.” Using thin layer chromatography (TLC), Williams and Fabirkiewicz are comparing lipid properties in the three major types of hair—African, Asian, and Caucasian. From there, they hope to discover a new method for lipid staining. So far, Williams has been practicing the TLC techniques on wool samples, which provide a close simulation to human hair. She believes this kind of experience aligns perfectly with her goal of entering a career in medical chemistry. Fabirkiewicz said the Summer Research program is a perfect time for Williams to get lab experience outside of the classroom.